Changing treatment patterns often dictate the need for a change in disease detection. • Home monitoring of some retinal diseases is desirable because better pretreatment visual acuity has been linked to better posttreatment visual acuity. • Patients do not always correctly share their Amsler grid assessment results with their treating physicians. • When the mVT system detects vision changes that meet or exceed a set standard, an electronic alert is automatically sent to the retina specialist. How can we safely perform a treat-and-extend (TAE) protocol in patients with diabetic macular edema (DME) or age-related macular degeneration (AMD)? Is it possible to use a self-monitoring strategy for this purpose? An iPhone app recently approved by the US Food and Drug Administration (FDA) aims to do just this with an approach that involves patient self-monitoring. This article examines how such a tool could be useful for patients with DME or wet AMD, and for follow-up in patients with high-risk dry AMD. Extending the timing of visits and treatments thus requires effective, reliable, and sensitive self-monitoring by patients to identify disease onset and recurrence that might otherwise result in quick and potentially permanent vision loss. Evidence demonstrates that early treatment of wet AMD and DME can save vision.4-8 Multiple studies note that pretreatment visual acuity is a predictor of visual acuity outcomes.4-8 Specifically, the better the pretreatment visual acuity, the better the posttreatment visual acuity. Thus, there is a clear medical need for trustworthy home monitoring to identify patients showing initial signs, onset, or recurrence of retina issues. The standard self-monitoring tool for home assessment has been the Amsler grid, which several studies have found to be unreliable and inaccurate.9-12 Patients do not always effectively communicate their results to their treating physician, and many who use the grid are unsure about vision changes or are hesitant to “bother” their doctors despite what they think could be a developing problem with their visual acuity. One recently developed approach to home monitoring is an FDA-cleared, computerized system that assesses visual field changes with the use of a desktop computer and a viewer. However, this system is expensive and immobile, and it requires time-consuming daily testing. It has not received widespread acceptance. Another new approach is a smartphone-based system that incorporates 10 vision tests into an app. The app is free to download, but patients who want to share their results with their physician are charged a fee. It is important to note that this app has not been submitted to or evaluated by the FDA. Additionally, validity, reliability, screen lighting, test frequency, optimal testing distance from the screen, and other factors have not been established. This year a novel, FDA-cleared, hand-held home monitoring system became available, and it may well meet the current medical need. The myVisionTrack system (mVT; Vital Art and Science) consists of a shape-discrimination hyperacuity testing app and a physician portal where test results are automatically stored and analyzed in a Health Insurance Portability and Accountability Act–compliant database. When the system detects important vision changes that meet or exceed a standard set by the treating retina specialist, an electronic alert is automatically sent to the specialist so that the patient can be contacted for quick in-office follow-up assessment and treatment, if necessary (Figure). The app operates on iPhones and iPads, and only 4 to 6 minutes of testing is required, twice a week, to separately assess both eyes. Automated patient reminders are sent to encourage adherence to the testing schedule. This technology is available at an average patient cost of $9 per month. Figure. In addition to automated patient reminders, mVT issues automatic electronic alerts like the one seen above to retina specialists when it detects vision changes that meet or exceed the standard set by the physician. The mVT system produces test results that are highly correlated with in-office physician assessment, and it has been demonstrated that patients are willing and able to use it.13,14 This home-monitoring technology is based on a shape-discrimination algorithm shown to be more sensitive than visual acuity testing in early-stage maculopathies, making it useful for detecting disease progression in patients with AMD or DME. Per FDA requirements, results are made available to the prescriber and not directly shared with patients, who might be tempted to self-diagnose. 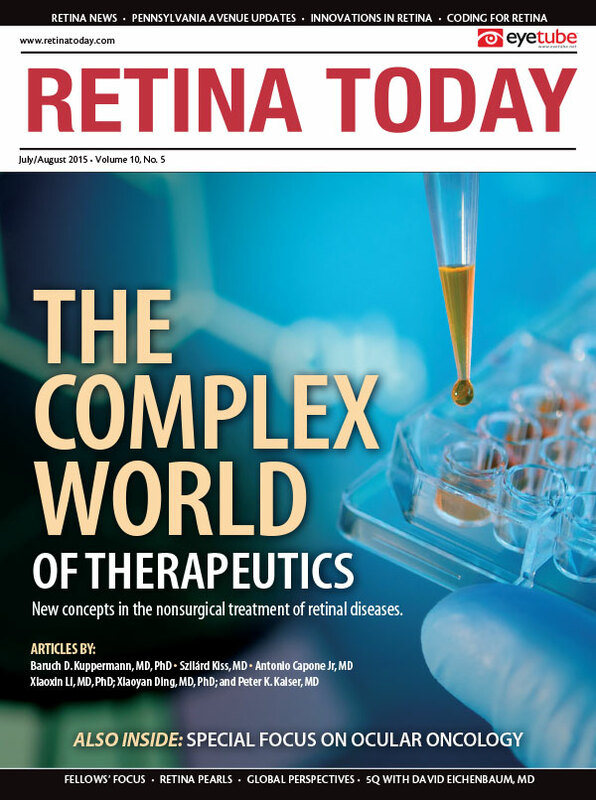 The service enables retina specialists to be more confident about following PRN or TAE dosing regimens because they know that disease onset or progression can be rapidly addressed to save vision. And, because patients know their eyes are being closely monitored, they can appreciate how this service offers them peace of mind. Vital Art and Science has already worked through numerous issues with the technology. For example, the screen brightness and volume are automatically set by the app, and the test distance from the eye to the screen can be anywhere from 14 to 24 inches. Bartlett et al investigated the latest FDA-cleared version of the mVT service and confirmed that the latest version improves test result reliability.17 Finally, a study by Lott and colleagues is evaluating the mVT service and nine other tools that may help predict which patients with early- to intermediate-stage AMD are at greatest risk of progressing to sight-threatening advanced disease.18 So far, they have determined that the mVT service is one of two tests showing the most significant predictive promise. Three of the above-mentioned clinical trials are ongoing and will build on the growing body of knowledge surrounding this home monitoring system.15,16,18 The US Patent and Trademark Office has awarded Vital Art and Science six patents based on the science and technology involved in the overall system. As wet AMD and DME treatment patterns change, this new technology appears to meet a medical need in the developing science of monitoring the eyes of patients with maculopathy. It also seems evident that it could be used by at-risk individuals (those with dry AMD as well as patients with diabetes who have healthy eyes but a family history of diabetic retinopathy). I have also found it to be helpful in patients with central serous retinopathy. With the service being new, I have noticed some bugs in the web-based software. For example, the login screen is somewhat difficult to see, and prescribing both eyes for testing is a little awkward. The company is addressing these issues. Long-term studies proving the service’s usefulness are still lacking, however. Hopefully, the company will consider performing these tests as part of a protocol to determine how well the data correlate and how much of a predictor hyperacuity testing can be for visual function. this device. Dr. Maturi may be reached at rmaturi@gmail.com. 1. The CATT Research Group. Ranibizumab and bevacizumab for neovascular age-related macular degeneration. New Eng J Med. 2011;364(20):1897-1908. 2. Rayess N, Houston SK 3rd, Gupta OP, et al. Treatment outcomes after 3 years in neovascular age-related macular degeneration using a treat-and-extend regimen. Am J Ophthalmol. 2015;159(1):3-8. 3. Holz FG, Tadayoni R, Beatty S, et al. Multi-country real-life experience of anti-vascular endothelial growth factor therapy for wet age-related macular degeneration. Br J Ophthalmol. 2014;99(2):220-226. 4. Liu L, Wang YZ, Bedell HE. Visual-function tests for self-monitoring of age-related macular degeneration. Optom Vis Sci. 2014;91(8):956-965. 5. Ying GS, Huang J, Maguire MG, et al; Comparison of Age-related Macular Degeneration Treatments Trials Research Group. Baseline predictors for one-year visual outcomes with ranibizumab or bevacizumab for neovascular age-related macular degeneration. Ophthalmology. 2013;120(1):122-129. 6. AREDS2-HOME Study Research Group, Chew EY, Clemons TE, Bressler SB, et al. Randomized trial of a home monitoring system for early detection of choroidal neovascularization home monitoring of the eye (HOME) study. Ophthalmology. 2014;121(2):535-544. 7. Rosenfeld PJ, Brown DM, Heier JS, et al; MARINA Study Group. Ranibizumab for neovascular age-related macular degeneration. N Engl J Med. 2006;355(14):1419-1431. 8. Rauch R, Weingessel B, Maca SM, Vecsei-Marlovits PV. Time to first treatment: the significance of early treatment of exudative age-related macular degeneration. Retina. 2012;32(7):1260-1264. 9. Schuchard RA. Validity and interpretation of Amsler grid reports. Arch Ophthalmol. 1993;11(6):776-780. 10. Achard OA, Safran AB, Duret FC, Ragama E. Role of the completion phenomenon in the evaluation of Amsler grid results. Am J Ophthalmol. 1995;120(3):322-329. 11. Crossland MD, Rubin GS. Eye movements and reading in macular disease: further support for the shrinking perceptual span hypothesis. Vision Res. 2006;46(4):590-597. 12. Liu L, Wang YZ, Bedell HE. Visual-function tests for self-monitoring of age-related macular degeneration. Optom Vis Sci. 2014;91(8):956-965. 13. Kaiser PK, Wang YZ, He YG, et al. Feasibility of a novel remote daily monitoring system for age-related macular degeneration using mobile handheld devices: results of a pilot study. Retina. 2013;33(9):1863-1870. 14. Wang YZ, He YG, Mitzel G, et al. Handheld shape discrimination hyperacuity test on a mobile device for remote monitoring of visual function in maculopathy. Invest Ophthalmol Vis Sci. 2013;54(8):5497-5505. 15. Wang YZ, He YG, Csaky K, et al. Diabetic retinopathy and the MyVisionTrack app (DRAMA Study). Paper presented at: The Association for Research in Vision and Ophthalmology annual meeting; May, 2015; Denver, Colorado. 16. Vazquez NP, Harding SP, Heimann H, Knox PC. Stability of performance of a handheld radial shape discrimination test in patients at risk of developing neovascular AMD. Paper presented at: The Association for Research in Vision and Ophthalmology annual meeting; May, 2015; Denver, Colorado. 17. Bartlett MB, Mitzel G, Zang S, Wang YZ. Comparison of myVisionTrack vision monitor performance with 3-alternativeforced-choice (3AFC) and 4AFC testing paradigms for assessing shape discrimination hyperacuity. Paper presented at: The Association for Research in Vision and Ophthalmology annual meeting; May, 2015; Denver, Colorado. 18. Lott LA, Schneck MD, Haegerstrom-Portnoy G, et al. Assessing non-standard vision function in early to intermediate AMD. Paper presented at: The Association for Research in Vision and Ophthalmology annual meeting; May, 2015; Denver, Colorado. 19. Querques G, Capuano V, Frascio P, et al. Emerging therapeutic options in age-related macular degeneration. Ophthalmic Res. 2015;53(4):194-199. 20. De Oliveira Dias JR, Rodrigues EB, Maia M, et al. Cytokines in neovascular age-related macular degeneration: fundamentals of targeted combination therapy. Br J Ophthalmol. 2011;95(12):1631-1637. 21. Wang CH, Hwang YS, Chiang PR, et al. Extended release of bevacizumab by thermosensitive biodegradable and biocompatible hydrogel. Biomacromolecules. 2012;13(1):40-48. 22. Tolentino MJ, Dennrick A, John E, Tolentino MS. Drugs in phase II clinical trials for the treatment of age-related macular degeneration. Expert Opin Investig Drugs. 2015;24(2):183-199.